Discover this delightful sunny holiday home with a fantastic view. Enjoy the beautiful view over the vineyards, fields and forests, as far as the eye can see. Enjoy your private covered terrace. No reason for the children to get bored in the garden with lawn, playground and sandpit. The neat and well kept interior makes you feel right at home. After visiting the many sights in the area close the day in style with a delicious barbecue! 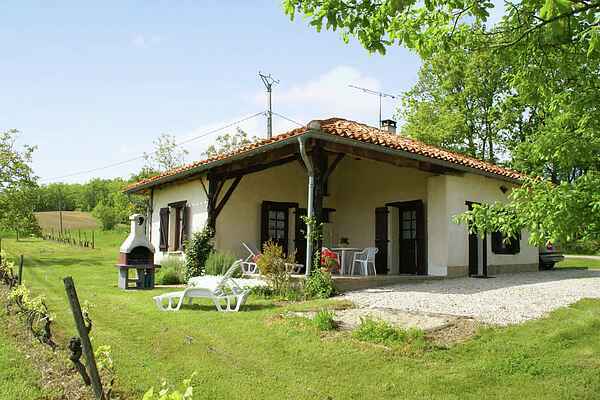 The holiday home is located 4 km east of Moliere. A great location to explore the interesting surroundings! Molières itself has a large swimming lake, with plenty of facilities (windsurfing, canoeing, fishing, playground equipment and tennis). You can also get your groceries in Moliere and there are restaurants as well. The river Aveyron is 9 km away, while its powerful gorge can be admired at 20 km distance. You will find numerous historic sites here like the towns Moissac, Réalville and Caussade (8 km) and Montpezat-de-Quercy (including pool). In Montauban (20 km) visit the monumental square with its arcades, the thousands of rose bushes in Parc Chambord, the 14th century bridge and the beautiful facades in the narrow streets.